Wash the chayotes and steam them without peeling. You can also boil them for 20 minutes or until soft. Remove from heat and cut in half length-wise. Discard the seed. Using a spoon, remove the pulp from the chayote, hollowing out a 1/2 cm-thick shell for filling. Place the removed pulp in a bowl and mash with a fork. Add the egg yolks, sliced almonds, raisins, sweet wine, salt, cinnamon and sugar. Fill the chayote “shells” with this mixture. Sprinkle with the bread crumbs and place the finished halves in a baking dish. Remove from heat, let cool and serve at room temperature. In Guatemala, the typical breadcrumbs used in this recipe are made from pan de coco or coconut bread. You can easily substitute this for crumbled coconut cookies or plain breadcrumbs. Before baking, add a tablespoon of shredded coconut over the chancletas. During a visit to the beautiful city of Quetzaltenango, also known by the lovely name of Xelajú, I discovered the famous Guatemalan chancletas. For me, it was a completely new experience–I had tried other types of chancletas before, stuffed with cheese or meat, but I never imagined that chayote squash could be transformed into such a rico dessert. The name is very amusing as well; chancletas are the name given to cheap flip-flops used for going to the beach or around the house, and can be bought in virtually any market in Latin America. Throughout the world, chayote is also known by many other names, such as güisquil in Guatemala and El Salvador or choko in Australia. To make this dessert, I use small green chayotes, since they hold their shape better when baked in the oven. 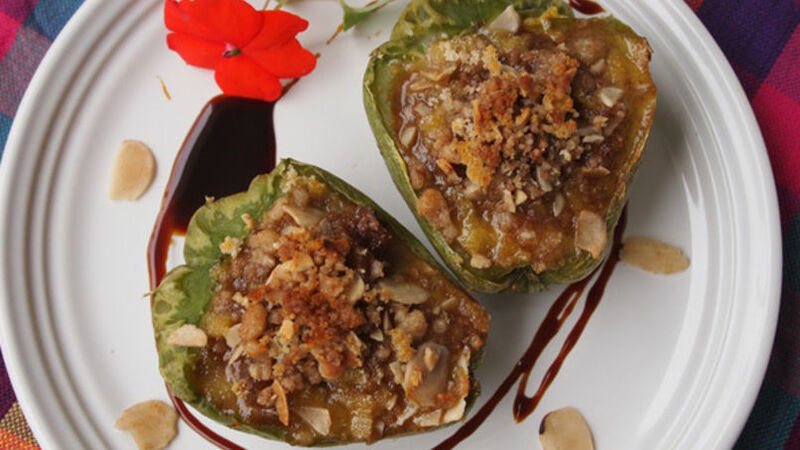 For the filling, use chayote pulp mixed with almonds, raisins and egg yolks. Serve lukewarm or at room temperature, accompanied by a cup of coffee. Hopefully you’ll find this new recipe to be a unique and delicioso addition to your kitchen. Let me know how it turns out!